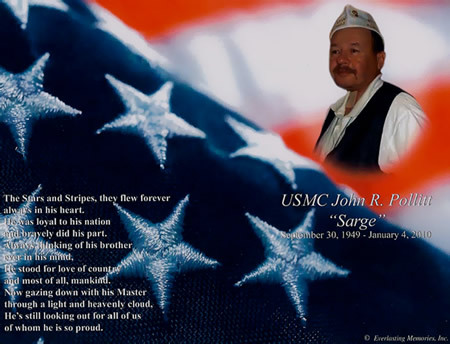 On January 4th, 2010 Donna Morsovillo's (founder Operation Welcome You Home) brother, USMC John "Sarge" Pollitt suddenly passed away. John was a true American hero who served his country in Viet Nam. John served with the Charlie Company, 1st Battalion, 26th Marine Regiment, 3rd Marine Division in Vietnam as a Mortarman. John was seriously wounded and suffered many complications due to his injuries. John was awarded the Purple Heart and Navy Citation, Combat Action Ribbon, Presidential Unit Citation, Vietnamese Service Ribbon, Republic of Vietnam Campaign Ribbon, National Defense Ribbon, Good Conduct Medal for his service. John was nicknamed Sarge and will always be remembered as a truly giving person. John was dedicated to serving with local groups including VFW where he held many positions including Commander. He was always ready to help his fellow man when he saw a need. John is missed by his family and many friends.